How did you get into farming? Matt: The interesting thing is that I had no intention of dairy farming. I had a summer job during college traveling and saw all these families, and I decided I wanted to raise kids on the farm. It shocked everybody. So, dairying had everything to do with raising a family. 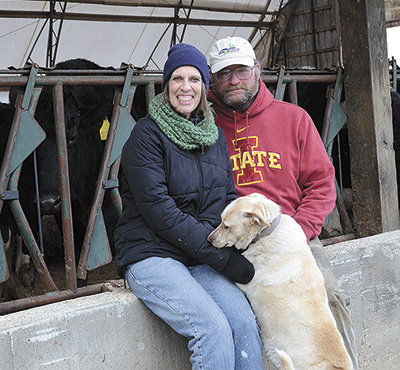 Diana: I was from a general livestock and crop farm near Sibley, Iowa, and met Matt at Iowa State. I was in veterinary school but left to farm with him. What are your thoughts and concerns for the dairy industry for the next year? The dairy industry has been on the short end of federal legislation, starting with the RFS in 2007. If we really wanted a mandate that would help our country, we would legislate that the school lunch program would serve only whole milk, as whole milk has been proven to reduce childhood obesity. Government programs since MILC have been ill-conceived. We can only hope that Collin Peterson’s new program is an improvement. I am concerned that dairy co-ops are no longer able to be competitive in dairy markets. What is the latest technology you implemented on the farm and purpose for it? Baleage of oat hay for dry cows and close-up heifers. Cows and heifers are calving in well and calves are healthy. What is a management practice you changed in the past year that benefited you? We’ve moderated what we spend on feed. What cost-saving steps have you implemented during the low milk price? We have returned to milking twice a day. Tell us about an attribute you possess that makes dairy farming easier for you. Perseverance. What do you enjoy most about dairy farming? Diana: I love animals. It’s a great way to raise a family. What advice would you give other dairy farmers? Look beyond the dollars. Dairy farming offers a unique way to develop children into responsible, well-grounded adults. What has been the best purchase you ever made on the farm? Our purchase of the Maytag herd in 1992 spurred our interest in successful breeding programs of the past. After dabbling in genetics of the Tenneson brothers in Washington and Bill Stoltzfus in Idaho, we discovered Harry Weir and his Dun-Did herd near Madison, Wis. We purchased three cows at his dispersal in 2001 and numerous bulls from him since. Most of our cows trace back to cows and bulls he developed. Harry Weir has bred an Ex-97 bull, and bred and exhibited the reserve champion Holstein at the World Dairy Expo. Those who follow him know he has been a true master breeder of the Holstein breed. What has been your biggest accomplishment while dairy farming? Our five children. One Iowa FFA vice president, three National Holstein Distinguished Junior Member semi-finalists, one National Holstein DJM finalist, one Iowa Dairy Princess, one Alternate Iowa Dairy Princess, three Iowa FFA proficiency awards, two Iowa FFA Star Finalists, five Iowa Holstein Distinguished Junior Members and five college-educated adults. What are your plans for your dairy farm in the next five years? Given our age, the next five years will probably be our final ones in dairy. How do you and your family like to spend time when you are not doing chores? We do a lot of grandkid stuff. They love to come out to the farm. We also have season tickets to Iowa State mens basketball. Matt has enjoyed Holstein history, and Diana is involved with Catholic Daughters of the Americas.